A romantic horse racing fan took the gamble of his life by sponsoring the ‘Will You Marry Me Tamsin Novices’ Chase’ and proposed to his girlfriend — live on national television. Matt Bailey, 34, re-named the race and dropped to one knee as it was announced over the loudspeaker and proposed to stunned Tamsin Hills – who thankfully said ”yes”. Spectators cheered and clapped the happy couple as the proposal was caught live on Sky TV before the 2.50pm at Newton Abbot Racecourse in Devon. Pub landlord Matt had been planning the gesture since May and kept the newspaper listings and race cards from Tamsin to maintain the ruse. Tamsin, 33, a solicitor for Stephens Scown in Truro, Cornwall, said: ”It was such a surprise. I had no clue at all. Matt, landlord of the Par Inn in Par, Cornwall, originally planned to propose in the morning, but was forced to delay because Tamsin too long getting ready. The couple, who have been together for 11 months, first met at secondary school. Matt laid on a bus for 37 of Tamsin’s friends and family – who were all sworn to secrecy – to watch the race. 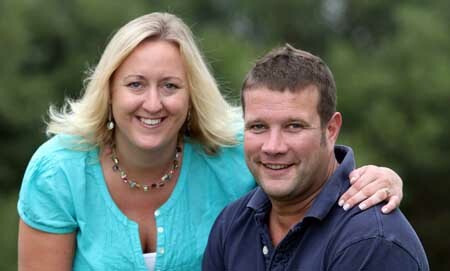 Tamsin burst out laughing before she said ‘yes’ and the proposal was broadcast live on At the Races on Sky television. The crowd cheered and the champagne popped as the two embraced, before the couple watched the race – and saw Matt’s horse lose him £200 when it failed to place. He said: ”It worked like a dream. It was a little hairy for a while as I was supposed to propose at breakfast but she took too long getting ready. ”Then as the day wore on it became a bit of a game. I hid the race cards and newspaper listings from her and was sure it would get out before I got chance to propose but I think she was surprised. ”It was difficult trying to keep it secret, we even had to stop the bus on the way here because I knew once we arrived it would get out. Alex Penn, sales and marketing manager for Newton Abbot Racecourse, said: ”Matt rang me in May and asked me to organise the proposal and I have secretly been planning it with him since then. The couple are now busy planning their big day for September next year. Matt proposed on Landlord’s Day, at which publicans traditionally pay around £500 to sponsor a race. But organisers agreed to waive the fee because he guaranteed so many visitors to the course.